…What Nourishes His Heart Is Not What He Gets From The Wheat, But What He Gives To The Wheat. It seems like many cuisines have their own ‘package’ food. Mexican food has burritos, Indian food has samosas, Japanese food has onigiri, Korean food has kimbap. This is a really common food for lunches, for picnics, times when you just need something that can be eaten easily without having to re-heat it or cook anything. It’s really a whole meal in a roll. The name simply means “seaweed rice”, and that’s basically what it is. This is one of those dishes that can be almost anything you want it to be – it would be simple to make it vegan, vegetarian, or with meat. This recipe uses fried fish cake, but is otherwise vegan. It would be a great way to use up scraps of vegetables you have just sitting in your kitchen, or you can buy things specifically for it and make it special. It’s a good idea to mix flavors, colors and textures so that you really get a great experience not only tasting it, but looking and it and even just chewing it as well. First prepare your fillings. 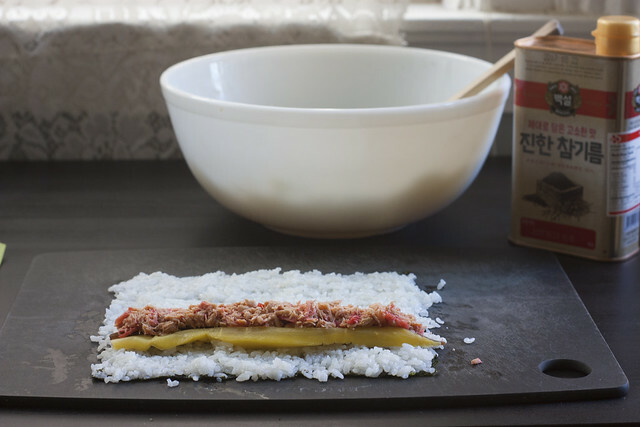 The pickled Korean radish can be purchased whole or already cut into long chunks (see the yellow vegetable in the above photo). Same with the burdock root. If you purchase them whole, cut them as seen above. Cut the fish cake into strips, and the cucumber and carrot into matchsticks. Cook your two cups of rice according to the directions on the package. This should be Korean or Japanese short to medium grain rice. 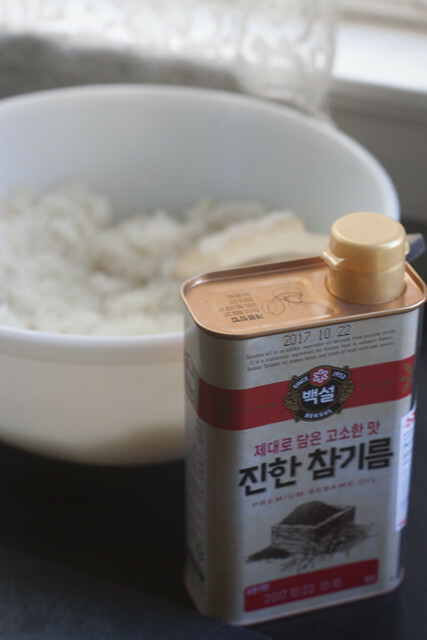 Once the rice is cooked, drizzle in a small amount of sesame oil, and salt to taste, and mix it well with a fork, chopsticks or a rice paddle. Set the rice aside to cool. Fill a bowl with cold water, and then in a small pot, bring plain water to boil. Toss in the spinach and let it sit for just one minute, until it is soft. Remove the spinach from the hot water, and put it in the cold water to stop it from cooking further. Once it has cooled, remove it from the cold water, and squeeze it firmly to remove most of the water. Toss the spinach with a small amount of sesame oil and salt. 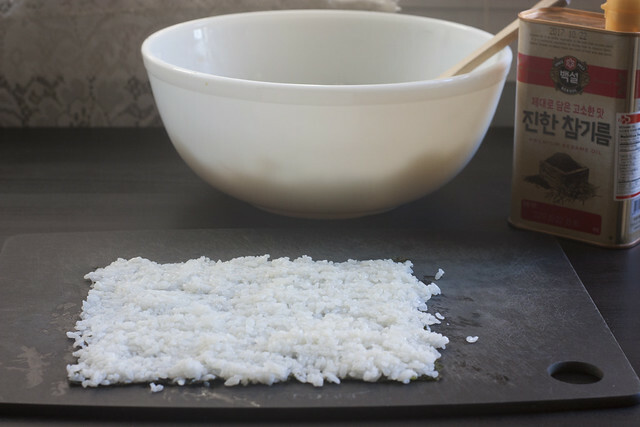 Once the rice has mostly cooled (it can still be warm, but you don’t want it to be wet or steaming much), lay out a sheet of seaweed, and thinly cover it with rice. Try to get the rice as close to the edges as you can. Lay out the fillings you are putting in perpendicular to your line of sight (parallel with the counter), towards the side of the seaweed closest to you. Don’t put too much in, or it will be difficult to wrap the whole thing around it. Lift up the edge of the seaweed closest to you, and fold it over the fillings. 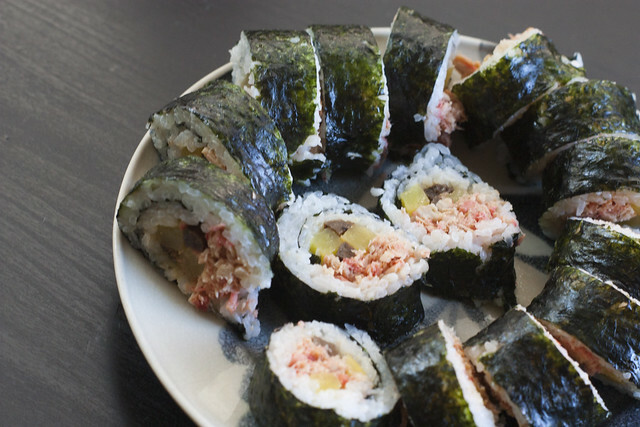 Tuck in the edge of the seaweed around the fillings tightly so that they are not loose inside the roll. Make sure the whole edge of the seaweed is evenly tucked in. 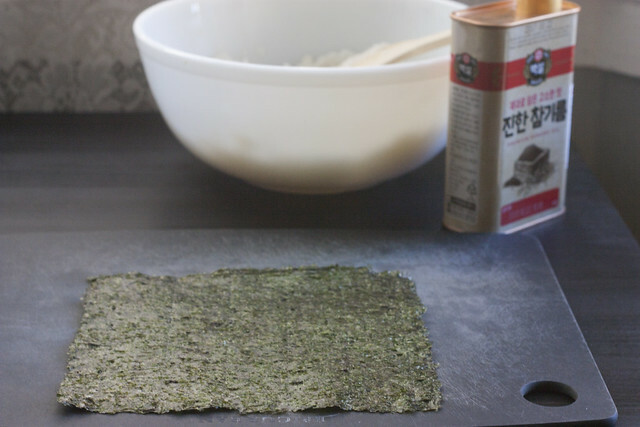 Finish rolling the seaweed until you get to the end and have a finished roll. Set the roll seam-side down and let sit for a few minutes to solidify. 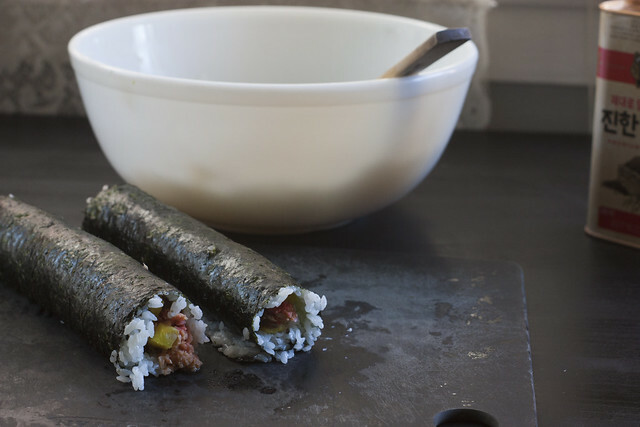 Either lightly wet your knife, or lightly coat it with sesame oil, and slice the rolls into bite-sized rounds. That’s it, you’re done! Enjoy!